I can remember playing with shadows as a kid, and having a blast. This is the ultimate in shadow fun. 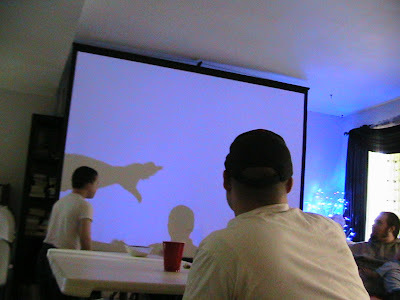 Uncle Fan has a giant movie projector screen, which makes the best shadows. The boys had so much fun! 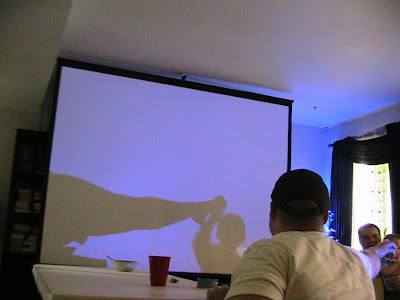 Did you watch movies on the big projector? 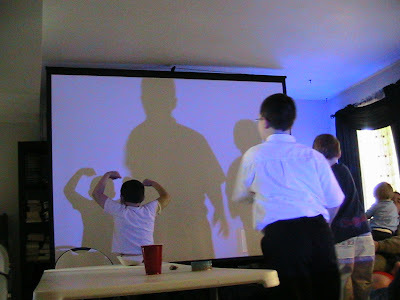 We use our wall in our bedroom and point the projector at it..it's pretty fun to watch movies on big screen! Fan has the projector hooked up to his computer, so we watched video clips from the computer. Music videos, and such. Usually when we're down, we'll watch a movie, but we didn't have a lot of time this trip. Movies are definitely fun to watch on the big screen though! The best is to watch football or baseball on the big screen. I would have rather watched the Cardinals on the big screen, especially as they whipped one of my most hated teams, the Houston Astros 10-1!